Teaching children to set goals when they're young establishes a habit they'll benefit from throughout their lives. The Family Education website recommends working with your children to set specific goals that are appropriate to their ages. Keep in mind that goals you set for your children are their goals, not yours. Once your child has set personal goals, help him with the tools to achieve them. Attention to good health should start at an early age, making this one of the first areas of goal setting. The Achieve-Goal-Setting-Success website claims that children will pick up health habits from you and your lifestyle. Teach your children that there are several factors in getting healthy and maintaining good health, including genetics, healthy eating and exercise. Your child should understand that he can't change his DNA, making that a set aspect of health. He can control what he eats. Help him work on a personal goal of a nutritious diet, following the guidelines of the U.S. Department of Agriculture food pyramid. Staying physically fit is another aspect of health he can control. Work together on setting a fitness and exercise goal that he can enjoy. One of the main causes of stress among most people is finance related. Start with financial goals to help them prioritize, save and exercise self-control with money. Set an example to your children so they don't get mixed messages. Have them work to earn money so they understand the value. Take them to a bank and open an account for savings. Encourage your children to be charitable with a set percent of their income. While your children are still in school, setting goals for what they want to accomplish with grades and extracurricular activities is important. 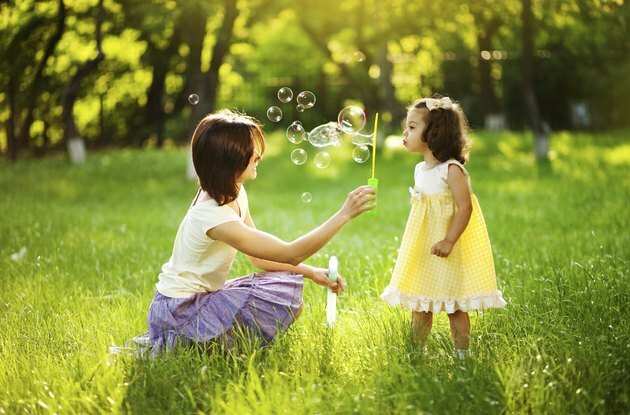 Be realistic on what your child can do and encourage her to set attainable goals. Goals can be reset later once you achieve your initial goals. School goals should be broken down into smaller objectives. If her goal is to bring her grade up to the next level, determine how much time she'll need to study each day to gain the skills for her tests. Include homework time and class attendance. Once your child is old enough to know what she wants to do with her life, help her plan a course of action for classes she'll need and levels of achievement she must attain to accomplish her goal. Add an individual goal section to your child's personal goal list. If he's messy, set a goal to get organized and establish a plan of removing clutter and spending more time putting things away. Some children may have a goal of playing an instrument. Institute a practice schedule with a realistic goal of a specific level of accomplishment, whether it's to master a song or to be able to play in a band. If your child is quick to lose his temper, he can set a goal to deal with things in a calm, rational manner.